Taka Kigawa performed the complete piano works of Pierre Boulez Monday night at Le Poisson Rouge. As he closes in on his 90th birthday in March, Pierre Boulez is entering a year-long celebration of his career as a composer, conductor, and cultural arbiter. 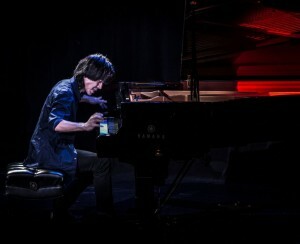 Taka Kigawa, one of the composer’s great keyboard interpreters, presented an early gift to New York audiences as the Japanese pianist churned through the complete canon of Boulez’s works for solo piano Monday night at Le Poisson Rouge. The two-hour program features six compositions spanning 60 years. Presented together, the half-dozen works traced Boulez’s relationship with serialism, his experiments in chance and improvisation, and his more recent style of the past decade. What came across was Boulez’s remarkable consistency, especially in the juxtaposition of extremes. Each work seems to capture the essence of his musical language: Languid and ethereal soundscapes punctuated by moments of flamboyant virtuosity, or a barely audible staccato contrasted with brash banging of a fist onto a keyboard. Delicate filigreed passages often devolve into a roiling crescendos or pummeling repeated notes. Kigawa smartly programmed the composer’s earliest work back-to-back with his most recent. Douze Notations, a serial piece originally written in 1945 is comprised of 12 distinct sections, each barely a minute in length and containing a concise musical thought. (And, in what is a common theme throughout Boulez’s career, they are still being adapted, reworked, and expanded into a piece for orchestra.) Kigawa played through them seamlessly from the pointillist “Fantastique,” to the spritely “Rapide” and the restrained twelfth part “Lent,” merging these vastly divergent portraits into a wonderfully colorful and cohesive whole. This piece was followed by the most recent work, Une page d’éphéméride (2005) the most compact of the six works. Over the years, Boulez’s spiky musical landscape has softened its edges slightly, but it still contains the same hues from six decades earlier, with large gestures, textural landscapes, repeated notes, and wide variations in dynamics. The program began with Incises, written in 1994 but revised in 2001. The piece began with an improvisatory subdued passage. Laying the groundwork for the rest of the concert, Kigawa meticulously navigated juxtapositions of extremes in pitch, dynamics, textures, and tempo. Midway through the piece he erupted in violent virtuoso cadenzas and repeated notes which dissolved into a dreamy landscape. From there, Kigawa jumped into the last of Boulez’s three piano sonatas, a landmark work in which Boulez asks the performer to choose the order of the movements and their subsections. Intended to consist of five “formants” or movement, only two exist in full and a third has been published in an incomplete state. Kigawa made an unconventional choice to open with what was conceived as the central movement, “Constellation-Miroir.” He navigated through a series of seemingly disjointed chords played with surgical precision, before jumping into rarely heard and still unfinished “Sigle,” a compact work that intones the highest and lowest notes on the keyboard before merging into a filigreed reverie. This progression culminated with the dense “Trope” that takes its name from a medieval term for plainchant, but seems to owe in larger part to spiky birdsong and experimental jazz. By comparison Boulez’s first two sonatas seemed rather conventional. The First, written in two movements, is a lush slow movement punctuated with rapid flourishes, and the Second a focused fast movement with lugubrious slow sections. The performance culminated in the tour-de-force Second Piano Sonata, in which Boulez systematically dismantles the framework of classical music, taking apart in successive movements sonata form, the slow movement, a scherzo, and the fugue. Though the work is an exercise in entropy, as tightly knit themes start unraveling into irregular rhythms and intervals, Kigawa disassembled it meticulously, bringing sharp focus to Boulez’s complex web of ideas. Played by memory, Kigawa showed off his athleticism, remarkable restraint, and delicacy in this lucid and lustrous interpretation.